Manage your Project from the Comfort of Home. Once we’ve come to your home and discussed your deck plans with you, you will have access to our website’s private project management system. This gives you personalized, password-protected 24/7 access to your plans, documents, schedule, warranty management, change orders and everything relevant to your project. With it, you can contact us at any time. 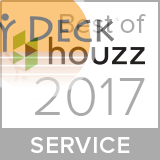 My Deck wants to provide you with professional and detailed customer service.